- The 940 cars for the B Division would be split into a base of 565 cars and an option of 375. - So the base would include 565 cars for the B Division (referred to as R211A) as well as the 75 cars for SIR (R211S) and the open gangway prototype cars (R211T). - The second option would include anywhere from 280 to 520 cars to probably be ordered in the next capital program. Here's the link, on page 123. Hmmm. Options beyond the initial number are confirmed. Lovely. At the max, that's 1,545 R211 cars. This will satisfy any needed service improvements on the B Division as well as wipe out all R46 cars and any remaining R32s. Interesting. 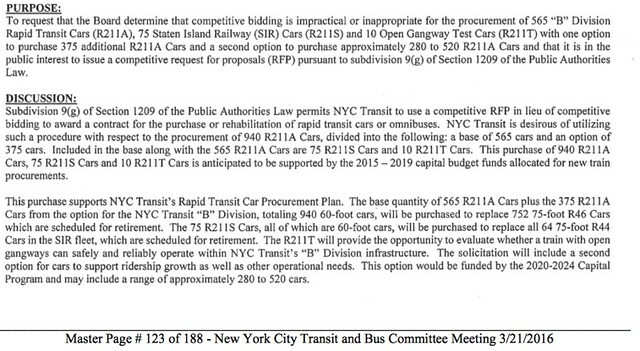 Sounds like the second option(280-520 cars) will be open gangway unless the prototype fails miserably. I doubt it will though. Any builder that gets the R211 will have already been constructing open gangway cars for 20+ years. Secondly, there's no reason for it to fail since the cars should be 60 feet long. The swinging ends issue does not exist at that length. 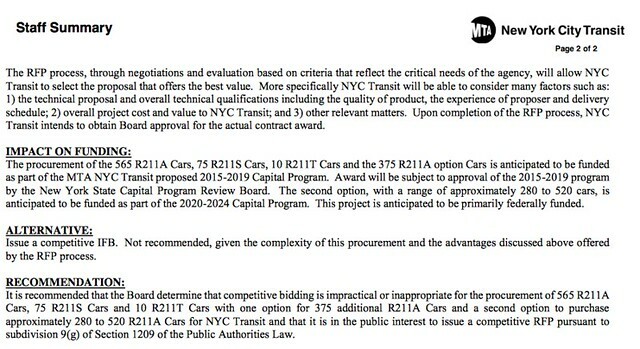 Also, looking at the document, the MTA is skipping numbers like wild fire. The next order of flat cars and flat car frames is R252 and R254. This could mean that the next two passenger car orders after R211 could be somewhere between R260 and R299. Since there would be no need to build any new cars after the R62/A and R68/A replacements, one could only guess that the following order would be in the R3XX aka the generation after the next. Isn't it too soon to start assigning equipment to the ? That's phase 3 (below 63rd), and I don't even hear that being forecasted yet. Now, they seem to be saying phase 2 will face delays. So that will be more decades. I heard if the comes online will be out of Coney Island Yard? Slightly off topic but I'm going through the old R211 thread and whoa. The things we thought we knew. My old posts are making me cringe so much. This is why I have come to learn such speculation is pointless and a waste of time lmao. Don't get me wrong, there were two people who were not ENY that hit it on the money though, early. It would have to be since there are few other options given the planned route of the Second Ave line. It might be Jamaica. Phase 3 includes a connection to Queens via 63rd St from 2nd Avenue. Does Jamaica have room? I thought that the only reason they store trains on Hillside Avenue is because Jamaica can't fit all of its cars. The MTA should just extend to the Bronx and build an elevated yard while property is still cheap. When the Washington Metro was still young, one of the problems was that every train had to come out of one yard, and it wasn’t like that yard was connected to all the lines that used it. They have the option of rebuilding the western portion of the yard (there's extra unused space). I heard Around 2018-2019 Jamaica is actually supposed to rehabbed their yard and expand it to add more subway cars as well as eliminating the weekend/late night layups. It's more convenient/logical if the were to be from Jamaica, as the trip from Coney to the 2nd Ave line is longer than that from Jamaica to the 2nd Ave line. What do you mean eliminate the layups? Keep them in service all night and weekend? I think he meant storing them in the yard rather than the express tracks. Is this a full two track connection? ie Christie Street? Also with Phase 1 how far down 2nd Ave did they tunnel south of the curve on 63rd if at all. You're a few days late sir, but thank you anyway. oops, I accidentally skipped over that post. Whatever. It's still good you posted it because I don't feel like going to pages of docs just to find my info. That very post told you what page it was on. Yeah but sometimes it gets annoying when you leave the doc and depending on the device you may have to start on page 1 and work your way over there. As a guy whose job involves manual labor, the fact that a person can call swiping through 100 pages of document "annoying" is painful to hear. I watched some of yesterday's board meeting and it was noted that the Chinese are in the process of qualifying themselves as a carbuilder for MTA. I don't believe they will be qualified in time for the R211 order but they will provide serious competition to Bombardier, Alstom, and Kawasaki on future procurement's especially if their cars perform well on other contracts they have won in US so far (Boston, Chicago, and potentially LA). I don't they they done any tunnel work south of 63rd street and it will be a two track connection.